The air quality level of Guwahati is at its worst between 6-8 pm in the evening as the pollutants in the air (PM 2.5) is recorded to be the highest on an average during this time. 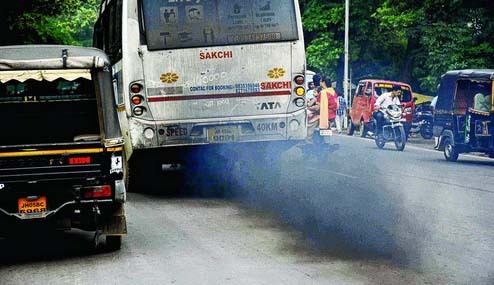 According to a report by GPlus, this was revealed by the Pollution Control Board of Assam’s (PCBA) continuous air quality monitoring station by analyzing two month’s worth of data. The city’s air pollution levels showed an increase in the past two months in the data. The average PM 2.5 level in the month of October in Guwahati was 53.36 which increased to 97.9 in November. PM 2.5 are fine particulate matters suspended in the air measuring two and a half microns or less in width. There are around 25,000 microns in an inch. The presence of high levels of PM 2.5 in the air reduces visibility and causes the air to appear hazy and can pose serious health-related risks particularly respiratory issues. The highest PM 2.5 level as recorded in an hour in October was 290, whereas the lowest was 1. Further, the highest PM 10 level for October was 1000 while the lowest PM 10 level in October was 18. PM 10 is another air pollutant measuring 10 micrometers or less in diameter. There are six air quality monitoring stations in Guwahati and 23 stations all over Assam which help in measuring air quality.